Love that sweater. You look so comfy and chic all together. Amazing! I want that sweatshirt! So cute (and also funny). Enjoy your time in LA! Love everything about this look! It's stylish yet comfy, right up my alley! I will be back tomorrow with my fingers crossed! 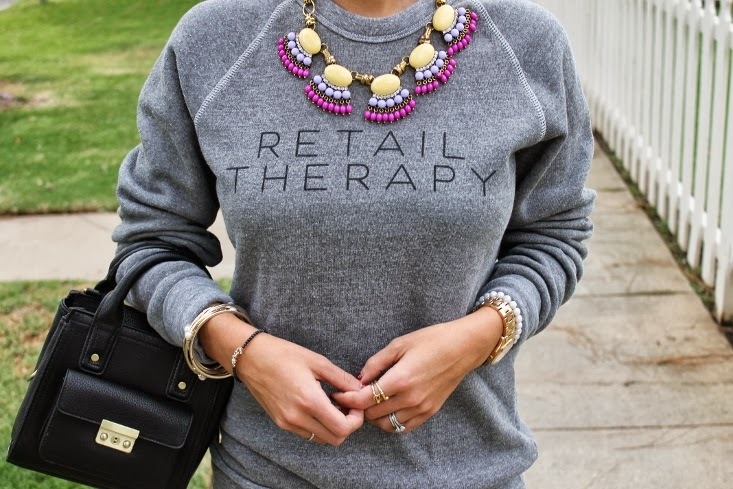 Such a great sweatshirt! Love the saying! And of course, the bag! That sweatshirt has been on wish list for a while! Loveeeee it! Perfect. That's all I have to say! Isn't retail therapy the best? I've been considering buying the same sweatshirt so I guess we're on the same proverbial style page. You may have just convinced me ;) Hope to see you at LuckyFABB? That is fabulous! Love that sweatshirt. And I love the way you styled it. Great look! Cute sweater ! And love how it pops with that funky necklace. I see you got one of the most coveted bags too.